On March 3, I heard John Taylor over lunch at the San Francisco Federal Reserve. In his talk he reviewed the government’s bailouts and their effects on our economy. If you aren’t familiar with Taylor, he co-authored, along with Bob Hall, the macroeconomics textbook most widely used these days. In addition, he served as undersecretary of the Treasury in the early Bush years where, among other responsibilities, he was tasked with bringing a new currency to Iraq. But for us economics nerds, he is most famous for formulating the Taylor Rule, a guideline for where the fed funds rate should be set. While there is more to it, the general idea is to use the inflation rate and the gap in GDP growth from its potential growth rate. To make sure that inflation doesn’t get out of control, the fed funds rate should be higher with higher inflation. When the economy is doing poorly, a lower fed funds rate can help the economy. 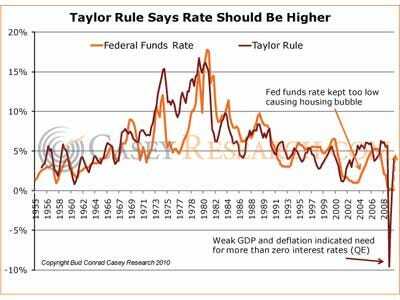 In the chart just below, I calculated what the Taylor Rule indicated would be a reasonable level for the fed funds rate (in orange), overlaid with the actual fed funds rate (in red). It shows how the Fed kept rates too low in 2004, fueling the housing bubble. That was Taylor’s major point and is documented in his latest book. A similar comment could be made about 1975-1977. The wild swing down at the end of 2008, with negative inflation and GDP growth, indicated that the economy was so bad that the rate should go below zero, an impossibility. Even so, that provides some justification for the extreme actions of the Fed in undertaking its quantitative easing. Looking to the future, the more important concern for me is that the end of the chart seems to indicate that the appropriate rate has already moved up to 4%. That’s because the measure of inflation used here for personal consumption expenditures has turned from negative to positive. If you think inflation will be rising and the economy will not be as bad going forward, you might expect rates to head higher soon. Of course, the Taylor Rule for rates and the actual rates don’t follow an exact track, but using data from the last quarter of 2009, we see a dramatic turnaround in the pressures on rates, based on the Taylor Rule. Taylor was surprisingly critical of the long lists of bailout programs, citing data that they had very little positive effect on other measures of the economy. He implied we would have done better with less of these measures, including the granddaddy of the Fed’s actions, to buy $1.25 trillion mortgage-backed securities (MBS), as mortgage rates dropped only slightly. He said we shouldn’t worry about deflation, as he considers it unlikely but felt that in the future we will be worrying about inflation. In combination, the conclusions I came away with were supportive of our position that the country’s economic problems are not over, and that inflation will be added to the list of those problems in the future.